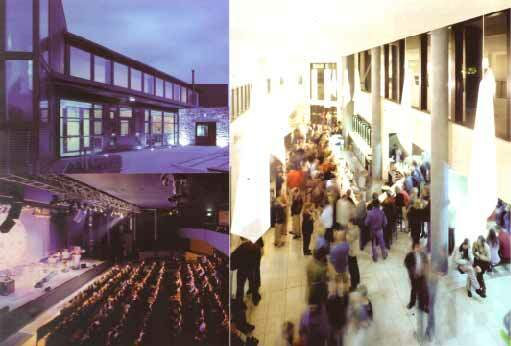 Glór Theatre and music centre in Ennis, Co.Clare was designed by Gilroy McMahon architects in 2001 and we were commissioned to provide the feature lighting for the foyer and bar areas. 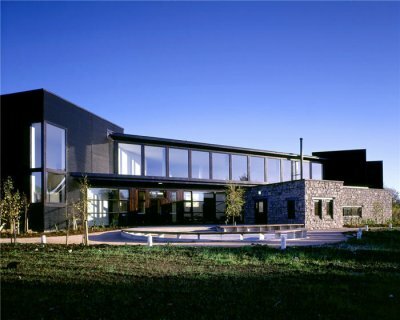 Architect Des McMahon had a specific Scandinavian approach to the design of the building and interior so we proposed using a frosted Polycarbonate material for the shades which kept the lighting a neutral warm white colour. The entrance foyer required 4 large pendants so we designed ‘Strip’, a 4m high cylindrical pendant with multiple light sources in a stainless steel spiral construction surrounded by a frosted shade in a series of overlapping strips. Further on in the main entrance hall we designed the ‘Fold’ pendant which is a simple shade made from a single sheet looped and affixed to a steel fitting and finally we produced the ‘Origami’ floor light for the bar area which again is a simple fitting produced from a creased and folded sheet around a stainless steel lamp base.